Veeraphol Klamsiri found the bag of money and returned it to Jerry Hart. A cab driver in Bangkok, Thailand, has been rewarded for his honesty after he returned a bag full of cash that an American tourist forgot in his taxi. According to Daily Mail, Jerry Allen Hart caught the cab to Suvarnabhumi Airport in Bangkok on Tuesday morning. However, while getting off the cab, he forgot his bag that contained more than 3 lakh baht - or approximately 10,000 USD. Mr Hart cancelled his flight and contacted the police when he realised he had forgotten his bag in the cab. Fortunately for him, his taxi driver Veeraphol Klamsiri found the bag while cleaning his car. According to Pattaya One, Mr Klamsiri, 57, said he found the money in a small cloth bag under his seat while cleaning his cab on Tuesday morning after driving a foreign passenger to Suvarnabhumi airport and another passenger to an inner Bangkok area. On finding the money, Mr Klamsiri contacted his local office, who in turn got in touch with police and asked him to drive back to the airport and return the cash to a very relieved Jerry Hart. 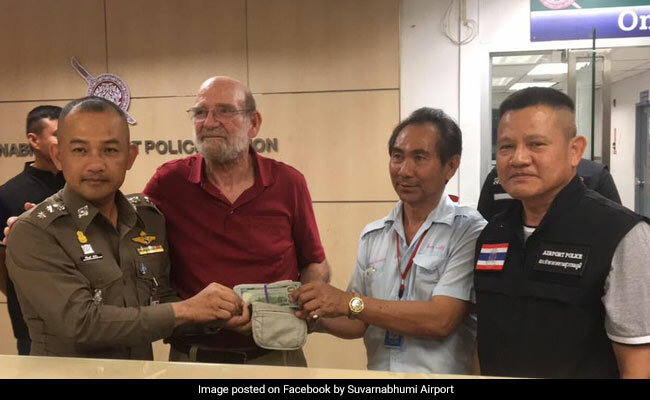 Suvarnabhumi Airport shared pictures of the moment Mr Hart received his money back on Facebook, where Mr Klamsiri has been widely praised for his honesty. "I'm very grateful to the honesty of the taxi driver. I've been to Thailand on holiday a few times before and I've been thinking of moving here to retire. This has made up my mind for me. I'm definitely coming back here to live," said Mr Hart to Daily Mail. Meanwhile, the airport decided to recognise and reward Mr Klamsiri for his honesty. Last year in Delhi, a cab driver returned a bag containing over Rs 8 lakh in cash and valuables that a tourist left in his vehicle.